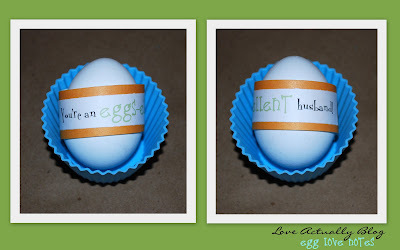 Love, Actually: Show Some Eggstra Love this Easter! 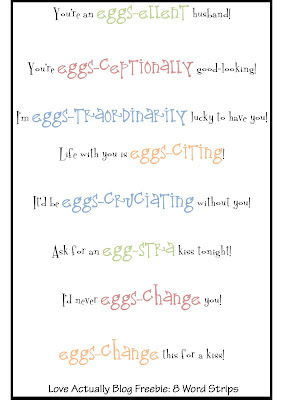 Show Some Eggstra Love this Easter! You already know by now how much I enjoy love notes...on every surface. So far, I think I've recommended love notes on the bathroom tile floor, mirror, shower wall, hidden around the house... and if those were enjoyed even just a little bit, then these oughtta be a hit. Of course, this idea was designed with the upcoming Easter holiday in mind, but, it's one of those ideas that works for anytime of the year as well! I don't know about you, but me and hubby eat eggs all year round. For these, I just took a mini alphabet stamp kit (found at Michael's for $1.00) and hand stamped my messages directly onto each egg. 2. Print out my freebie below. 3. Attach each word strip to a colored paper strip. 4. Use glue-tape to adhere the strip to the egg. 5. Pack in your husband's lunch. Don't forget to get entered for the current GIVEAWAY ending today!! Love these!! I will have to pack some in the hubbies lunch! I love this idea - as always! Thanks for sharing! 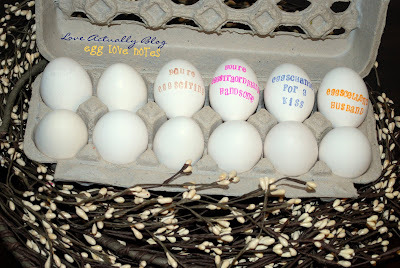 Love it...my husband eats eggs a lot, so I will definitely be using this idea very soon! I just LOVE your blog! Thanks for sharing all of the good ideas! Darling...I just wish my husband liked hard-boiled eggs. I LOVE these! I will be showing them off tomorrow! Thanks so much for linking up! You can join me for another link party today. Cute idea, love it! Thankfully my husband opens the egg carton daily, so this should be a good one for us!